A Release key building block is used to release any previously pressed keys on the keyboard. This can be useful for instance when needing to hold down a CTRL key and drag the mouse. It is used in combination with the Press key block. See the Press and hold a key lesson for an example of how this works. The green input connector in the header is used to trigger the block to start executing, and any previously pressed keys to be released. The green output connector in the header triggers when the keys have been released. The title of the block (“Release Key”) can be changed by double-clicking on it and typing in a new title. 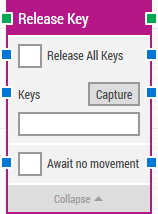 Release all previously pressed keys at once instead of a specific key combination. A single key or a combination of keys to be released after having previously been pressed on the keyboard. Can only be entered by clicking the “Capture” button (see below). Click to capture key combinations into the Keys value. This makes it easy to press and hold special key combinations such as CTRL+C, ENTER, etc. Delay the key release until there has been no movement on the screen for a specific period of time — for instance 2 seconds. This is useful when waiting for a screen update to occur, for instance a page loading in a browser window. Regardless of this checkbox, the key release will occur after waiting a maximum of 30 seconds.